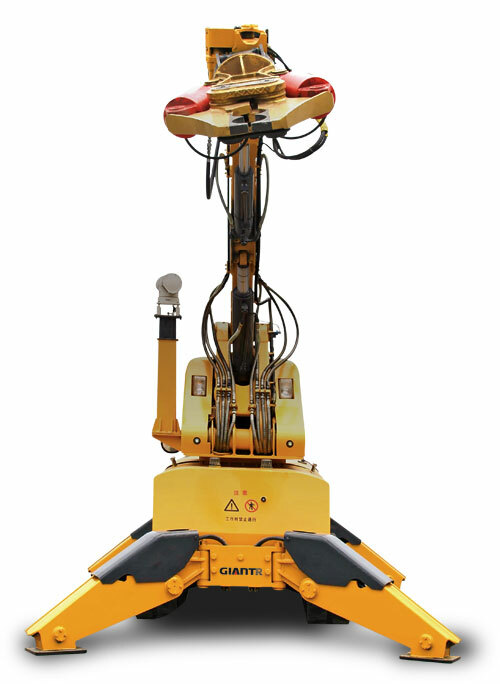 • High safety: it adopts digital video infrared monitoring and wire/wireless remote control system, and the operator can be away from the dangerous site; the robot adopts low center of gravity, featuring reliable operation. The human and machine are safe in the operation. • Environmental care: it adopts electric-hydraulic proportional drive, featuring stable operation, low vibration and low noise. With motor drive or low pollution diesel drive, the machine could reach Europe EC standard without any harmful gas or low polluted gas. • Energy conservation: it adopts load feedback variable pump system, and the system output is adjust by itself with the load requirement without any energy loss. • High operation efficiency: it adopts the advanced GT hydraulic breaker and other hydraulic tools, featuring high breaking efficiency. The operation system features accuracy, flexibility and high efficiency. • Wide application and strong adaptation: it could be used in metallurgy and cement industry, building demolition industry, rescue industry, nuclear energy and chemical industry, mining exploitation and tunnel construction industry. 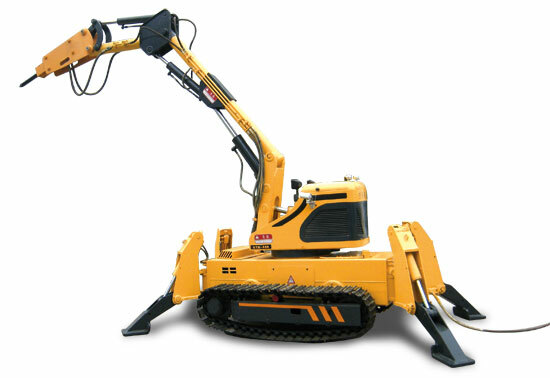 The robot adapts to the condition of tough ground and narrow area. • It features multiple functions. 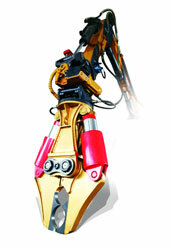 The arm end is equipped with quick coupler, which is easy to replace with breaker, shear, bucket, grab, drill and miller. 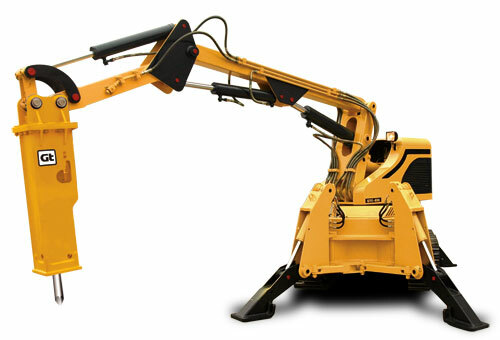 • It adopts three-section working mechanism with large operation range. It could reach the hitting point, hitting angle and direction flexibly in the operation range. • Compact structure, metal track, 360° rotation. • It adopts the advanced digital wireless remote control technology and digital video infrared monitoring technology. • The advanced load feedback variable pump electric-hydraulic proportional hydraulic system is applied. The actuator element could reach stepless speed adjustment, and the operation speed has nothing to do with the load change. • Two power sources: motor drive or diesel drive. • The optional forced cooling system ensures that the robot could work in high temperature. In the emergent conditions such as earthquake, fire, mine disaster, terrorist attack, radioactive pollution, and toxic chemical material leakage, the rescuer could operate the machine remotely.